More and more projects use plywood in the making process, and the manufactured board comes in various types, sizes, and grades to adjust to different project purposes. Initially, the term plywood is referred to the wood panel made of numbers of thin sheets of wood, bonded with super sticky glue under high pressure and heat that resulted in a multi-layered veneer. Types of plywood in modern architecture refer to all engineered wood panels used to make a various form of buildings from a shelf to a gazebo. Compared to traditional loggings, plywood makes cheaper and more versatile option in present construction, while offering strong and sturdy material in all direction as opposed to traditional wood–thanks to the grains that go length and crossways. When it comes to choosing the correct types of plywood, you need to figure out its purpose first. Some projects require thick boards; some others won’t; that decided by the thickness of the veneer to create different layers of plies. 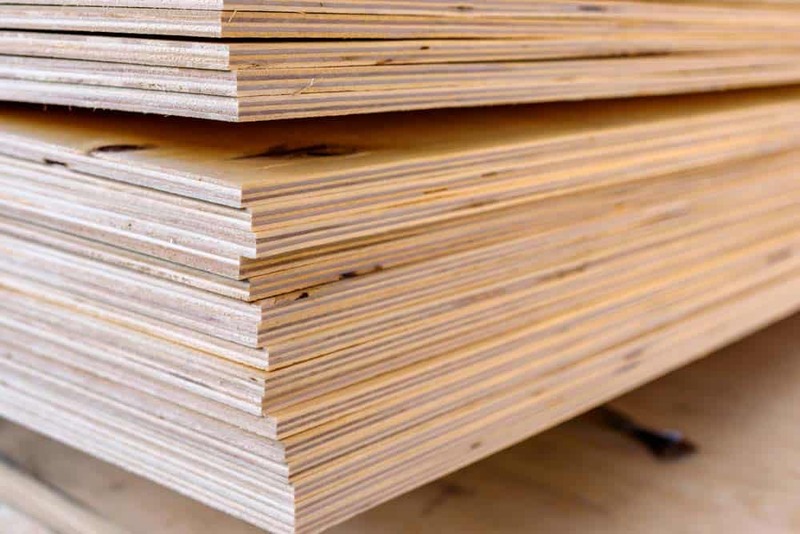 Also depending on your project location, be it in a roof, external walls, or indoor cabinets, here are some plywood types available on the market to use. Among other manufactured plywood in the market, softwood is the commonest type, making it the most affordable one to get. This plywood is made from redwood, cedar, or pine with sizes ranging from 4 x 8 inches to 5 x 5 inches with different grades, adjusted to its application. This type of plywood mainly used in coating the subfloors, building wall and roof layers, frame sheathing, as well as DIYs doghouses and shelving. Thanks to its professional-looking material, hardwood plywood is mostly applied in furniture making process that includes tables, chairs, musical instrument, sporting equipment, and the likes. This type of plywood is made of ash, oak, maple, mahogany, walnut, birch, or other hardwood logs with smooth finishing look and attractive surface. The glossy and sturdy appearance creates interesting layers. Some manufacturers produce hardwood plywood with the same method and materials as the softwood plywood, except they’re using hardwood materials to create the outer layer surface. Others also refer to this plywood as the cabinet grade plywood since they serve as the materials in building cabinets and shelves. In general, this plywood comes in AB grades. This plywood lives up to its name–apart from being water-resistant–as the marine type is designed to endure high-moisture environment, resistant to extreme weather and temperature. Its outer layer is coated with water-resistant glue with the same layering construction method as the other plywood. The layers are bonded using top-performing water boiled proof glue to prevent the plywood creating core gap or cracks or knotholes. Marine plywood is among the highest plywood grades and best-manufactured one, which consists of douglas fir woods or higher quality. It is graded B or more advanced. It’s better to treat the surface with a pressure-preservative coating to improve marine plywood life expectancy, APA-graded to prevent rot, mold, or decay. With such quality, marine plywood often used to build outdoor furniture, including benches. Mostly found in the making of import panels, the lumber core plywood also often incorporated as core ingredients in closets and cabinets making. This plywood usually only has 18mm-thick panels that consist of a face veneer, back veneer, and crossband veneer that glued together in the center. The three-layered plywood is made from basswood on the inner layer and hardwood on the outer layer. Plumber core has an excellent ability to bounce back, that is particularly useful when constructing long and wide shelves. Its inner core helps to hold screw since it has a good grasp strongly. Unfortunately, lumber core plywood mostly has voids or gaps that are declining its strength. The next types of plywood are the commonest one but do not suitable for building material. The particle board is mainly made from a combination of shavings, sawdust, and other tiny particles of woods. They are mixed with strong glue then pressed to make the form of board arrival. Since particle board is manufactured from pieces of woods, it is considered as the weakest plywood of all types. Particle board is mostly used to strengthen the top layer of construction, or to laminate countertops as well as to build shelves, and then trimmed using solid wood surface. If you desire for a higher-end project with the sophisticated and modern finished look, aircraft plywood can make an excellent choice possible on the market today. This type of plywood is very strong, durable, and highly resistant to the various environment. Aircraft plywood is made from high-quality wood like birch or mahogany and manufactured in the highest grade. This plywood is astonishingly sturdy, strong, resistant to heat and moisture made with thin veneer layers to add flexibility. Aircraft plywood is mostly incorporated in heavy-duty projects like boat-making, airplanes, and furniture. The appearance of overlaid plywood has a resemblance of regular hardwood plywood, only with a more striking finished look. The plywood is made of wood sheets glued together with veneers with an overlaid face that is durable enough to resist water or other damaging particles sticking onto it. The finished outer surface is not just a pretty face since the manufacturer bonds the exterior-making process through high pressure and heat process. The panels are considered as high-density overlaid with more resin that affects its selling price on the market. Whether it’s softwood or hardwood, the quality of plywood is also determined by the grade, allowing you to understand its material quality, density, and building purposes. The standard grading system of the construction material uses letters from A to D; counting A as the highest grade, followed by B, C, then D grade. When the plywood is stamped X, it means it meets the standard for external use. Plywood grades A explains that the material has no blemishes, gaps, and well-sanded, while the D-grade exposes the wood with most blemishes. In most cases, one plywood may be stamped with a different grade on each of its surface. If one side has the higher grade, while the other has the lower grade (A-B or A-C), that indicates an installation should be done with the lower grade facing the platform. Despite having different grades, types of plywood also come in different sizes. The most common plywood sizes come in ¾, ½, or ¼ inches thick, even their sizes are ranging from ⅛ to 1 ¼ inch thick, that is available in three, five, or seven piles. Their length and dimension are also varied depending on your needs. So, whether you are building a bench, a gazebo, or a cabinet in the laundry room, choose the plywood that meets your requirements.